Life is paradox: As Aesop noted, dogs enjoy greater security than wolves, but lack freedom. Wolves have more freedom than dogs but may be eaten by even stronger denizens of the wild. We encounter things never imagined, such as Black Swans. What appears strong turns out to be fragile. People in high places may feel insecure. Well paid assistants to corporate presidents may fear to speak out lest they lose their privileges. The way to create social equality is to compel corporate and political leaders to have skin in the game. They should not enjoy big profits unless they suffer the consequences of bad judgment. Terrorists should not be allowed to blow up innocents trusting that their families will be spared punishment for their brutal deeds. “The entire point of the book is that in the real world it is hard to disentangle ethics on one hand from knowledge and competence on the other.” There are asymmetries of power, but if you inflict risk on others and they are damaged, you need to pay some price for it. To use two cases not cited by Taleb: George W. Bush made horrendous mistakes that brought great suffering to peoples of the Middle East and the United States, but won a second term and, having retired, enjoys a new avocation—oil painting. As of 2018, the new U.S. president has used his office to enhance his business interests while fostering rules and laws that harm the commonweal—without, as yet, alienating most of his base. Interventionistas like those who argued for changing the regime in Iraq and Libya fail to consider the second- and third-order consequences of their acts. Complex systems do not have obvious one-dimensional cause-and-effect mechanisms. Given the opacity of such systems, it is wise not to intervene. One cannot compare a third-world dictator with the prime minister of Sweden; one must consider the real local alternative. One cannot forecast the evolution of those one hopes to help by attacking. The principle of intervention, like that of healers, should be first do no harm. In ancient times most leaders were warlords—warriors who risked death in battle. Societies were run by risk takers, not risk transferors. America’s large banks, however, have been run and coddled by leaders with no skin in the game. If their bets paid off, they won big; if the banks teetered, the public bailed them out—what Taleb calls the “Bob Rubin trade.” Transferring the pain of risk in this way impedes learning. While individual leaders are often slow to learn, sometimes the system learns and supplants those individuals. Systems learn by removing parts, via negativa. It is safer to remove a bad component of the system than to add a new component, due to unseen, complicated feedback loops. Systems get smart by elimination. Kant’s universalism (the categorical imperative) ignores the problem of scaling. It refers to the abstract instead of the particular. Universalism conflates the micro and the macro. It misses central but hidden elements of a thing in turning it into an abstract concept, then causing a blowup. But risk and ruin are different things. It may be good for your health to jump from a bench to the floor but not from the top of a skyscraper. It can be smart to take a lot of risks that don’t have tail risks but offer tail profits. One can love risks but shun ruin. In a strategy that entails ruin, benefits never offset the risks. Rationality seeks to avoid systemic ruin. Taleb is skeptical about pseudo-rationality. People without skin in the game but who are rewarded for their time often seek complicated solutions for problems that can be solved with simple answers. Their scientism is to science what a Ponzi scheme is to investment. Taleb proposes a “BS detection heuristic”: if job applicants seem to have similar skills, hire the one with the least “label-oriented education.” He or she will have overcome more serious hurdles. Similarly, a barbell will make you stronger than a fancy machine. “When people get rich, they shed their skin-in-the-game-driven experimental mechanism. They lose their own preferences and submit to what “consultant” sales people recommend. Thus, we come to understand “skin in the game.” It is contact with reality that filters out incompetence. Reality is blind to looks and to Ivy league diplomas. Ronald Reagan was an actor who looked like a president; Obama looked like a president but was also an actor. (Taleb, like Trump, attended the Wharton School but also has a doctorate from the University of Paris.) Taleb approves people who have had some success in spite of not looking the part. “Deeds Before Words” is the title of Taleb’s chapter 11. An assassin or terrorist can control others without words—a dagger in the ground next to a Turkish sultan or a severed horse head in the bed of a Hollywood executive. Historians and journalists sometimes multiply the effect of terror by exaggerating the numbers of its victims, e.g., the 1982 “massacre” of Syrian jihadis by Assad senior. 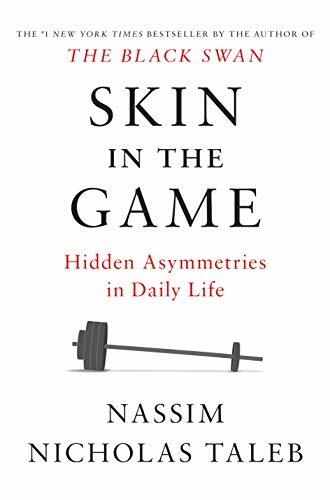 Taleb sums up his life’s work: There is no love without sacrifice, no power without fairness, no facts without rigor, no statistics without logic, no teaching without experience, no complication without depth, no science without skepticism, and nothing without skin in the game. This fifth volume of Taleb’s Incerto series will stimulate most readers to reflect on every aspect of his or her life, and may help them to navigate without great mishaps in its dark woods. It may also make them wonder in the presence of a systems analyst who backs his ideas with algorithms and with references to the classics from Plato to Mahabharata to Immanuel Kant but who often expresses himself not just in popular language but even in three- and four-letter words. He often quotes from the original Arabic, French, Greek, and Latin as well as version of “Brooklynese.” Taleb’s heritage is Greek Christian but his name, in Arabic, means “student.” A glossary defining 24 terms offers a summary of the book’s main ideas. A technical appendix explains fat tails and other terms mathematically.